One Sky has teamed up with Benji Kamara, a Sierra Leonean now living in Canada, to help you give a gift of a child’s future. You can make a donation to the ‘Sowing a Seed’ project in the name of a friend or relative, and see what the spirit of giving can really accomplish! Your donation of $25-$100 will pay for school fees, uniforms, books and exam fees for eager students in Sierra Leone. ‘Sowing a Seed’ falls under the umbrella of One Sky’s Growing at the Grassroots Project in Sierra Leone, funded primarily through the Canadian International Development Agency. Begun by volunteers in Smithers in 2006, Sowing a Seed has raised almost $20,000 to support school children in Sierra Leone. You can contribute yourself or you can give a meaningful gift to a loved one by making a donation on their behalf. A certificate describing the donation will be sent in the mail to the recipient of your choice. 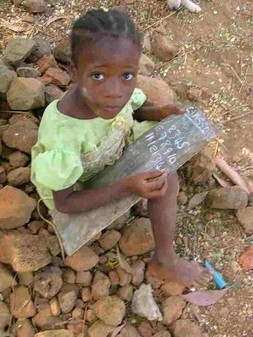 And a child in Sierra Leone receives the gift of education. Please note: we will only send out gift certificates before Christmas if you donate before December 18th! Otherwise we will send your gift certificate after the holidays. Please note the above link will redirect you to the Sowing Seeds in Sierra Leone website which will provide information on how to make a donation and where to send it. In December 2006, Benji Kamara traveled back home to distribute funds raised in partnership with One Sky to support children to go to school in Sierra Leone. Fundraising events were held in Smithers leading up to Christmas, and donations poured in from the Bulkley Valley – and beyond. In the first year an amazing $7,376.65 was raised, resulting in 450 children in Sierra Leone benefiting from the project! Future opportunities are even more limited for teenage mothers, so the project also helped a number of teen mothers get back to school. Along the way, Benji also applied strategies to ensure that the impacts of this fundraiser created even larger ripples – uniforms were bought from local traders, sewn by local tailors and books bought from local booksellers. Our amazing volunteers in Freetown – Ralph, Nurudeen, Med, Mohammed, Kathryn and Bonamin – helped with the logistics of distributing funding and materials, and the Freetown community jumped in with their own assistance. The booksellers greatly reduced the price of books bought for the project and a local carver donated a sign thanking children at Muheim and Walnut Park elementary schools in Smithers who had fundraised for the project. Sierra Leoneans who heard about the project were proud of the efforts of Benji, someone from their own community who had returned to give back to his people. The pride and spirit were palpable – Benji could hardly walk through the streets of Freetown without school children, parents, teachers, tailors, traders and other community members thanking him from their hearts for the impact of the project. 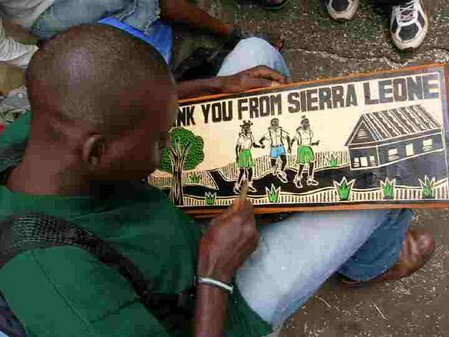 With obvious support for the project from Smithers to Sierra Leone, a group of committed volunteers continued with the Sowing a Seed project in 2007-08, raising over $10,000! Over 900 school children benefited from this amazing support and the project was able to expand beyond Freetown to the city of Koidu in the eastern part of the country. Koidu was one of the hardest hit regions during the war. Supporting school children here has the potential to create positive opportunities and hope in a struggling region. The project continues in 2008-09 with a dedicated group of volunteers organizing events and raising funds in Smithers and beyond. The goal is to continue supporting existing beneficiaries, so that students are supported as the move from elementary school, to secondary school and beyond. We have added support for a small number of post-secondary students to study nursing or electrical installation at a trade school in Freetown. 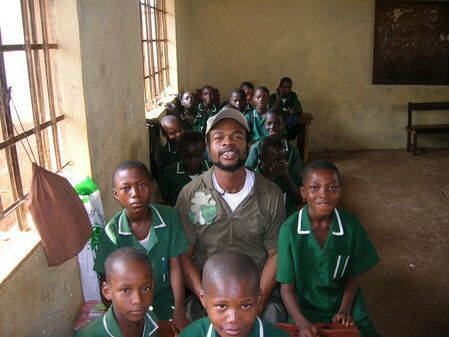 Thank-you all for helping to sow seeds of education and community in Sierra Leone. This project is an entirely volunteer run effort. Many, many thanks to our organizers - Craig, Emily, Jeff, Sarah and Armel; our plant growers in 2006, Ben and Jessica; our many volunteers in Smithers who helped out at craft sales; the 10,000 Villages organizers for their donations; Russell Maier and Alpine Plant World for donations and to Anne-Marie and Donna and the AMAZING kids at Muheim, Walnut Park and St. Joseph’s Elementary schools for their fundraising efforts. In Freetown, much love and appreciation to trusty volunteers Ralph (Judah), Mohammed (Toesman), Med, Bonamin, Kathryn and Nurudean for their many volunteer hours, to Supercaps and the other booksellers for their donations, to Mohammed for the beautiful carvings, and to all the principals and teachers who helped out. Finally, thanks to each and every one of you who donated to this project – you have made over 900 children in Sierra Leone very happy! We couldn’t have done it without you. • Textbooks, exercise books and other school supplies for 243 children at the United Methodist Church primary school in Eastern Freetown. • Books, learning materials for one class (57 children) at Cathedral Primary. • Reading materials for one class (60 children) at St. Joseph’s Elementary. • One full package of school books for 40 primary school kids. • Uniforms for 43 primary school kids. • Registered 27 primary school kids and re-registered 15 high school girls. • Paid school fees for 50 Junior secondary school students, mainly girls. • One full package of books for 6 Junior secondary school kids. • School fees for 40 Senior Secondary School kids. • Full package of books for 8 Senior Secondary School kids.